Located on the island of Newfoundland in the Atlantic Ocean, the city of St. John’s is the most easterly city in Canada. It is known for its unique architecture, vibrant culture and friendly locals. The best time to visit is from mid-June to early September when temperatures usually range from 11C to 21 C.
Overlooking St. John’s Harbour, Signal Hill offers a spectacular view of the downtown area and the ocean. It is also famous for being the site where in 1901, Gugliermo Marconi received the first transatlantic wireless signal. Cabot Tower, a castle-like building which sits atop the hill, was built in 1897 to mark the 400th anniversary of John Cabot’s voyage to St. John’s. Inside the tower, you can find a gift shop, historical exhibits, and an outdoor observation deck. There are also a few hiking trails nearby where you can get fantastic views of the ocean. As it can get extremely windy on Signal Hill, bring a jacket with you (even in summer) and avoid walking too near the edge of the cliffs. With its rocky cliffs and fantastic views of the Atlantic Ocean, this National Historic Site is an excellent place for watching the sunrise, hiking, and trying to spot whales or icebergs. Cape Spear also has two lighthouses and a World War II battery. Fort Amherst is located at the entrance of St. John’s harbour. Here you can see a small lighthouse as well as the remains of cannons and fortifications built during World War II to defend against German U-Boats. A short walk from the Basilica is one of the most unique buildings in the downtown area, The Rooms, which houses Newfoundland’s archives, museum and art gallery. It is a mix of traditional and modern architecture, with its design based on fishing rooms where families worked together in the past. It has big glass windows which provide a great view of the harbour. Due to its proximity to the Atlantic Ocean, St. John’s is an excellent place to go whale-watching if you visit between May and September. There are three main whale watching companies in the St. John’s area – Iceberg Quest, Gatheralls’ and O’Brien’s. Boat tours with Iceberg Quest leave straight from St. John’s harbour, while you must drive about 40 minutes to Bay Bulls to go whale-watching with Gatheralls’ or O’Brien’s. On whale-watching tours, you can also see seabirds, caves and sometimes even icebergs. The East Coast Trail is a hiking trail system that connects more than 30 different communities in Newfoundland. From St. John’s, you can hike north or south, viewing spectacular scenery along the way! Within St. John’s, there is the Grand Concourse trail system, where you can go on walks around lakes or alongside rivers. Downtown St. John’s has many unique boutiques, cafes, and art galleries, so it is worth it to spend a few hours exploring the area, especially Water Street. In the downtown area, you can admire the colourful “jellybean houses”- small rectangle-shaped houses painted in bright colours. At night, you can visit George Street, which is believed to have the most pubs and bars per square foot of any street in North America. Colonial Building, the former home of the Newfoundland government. 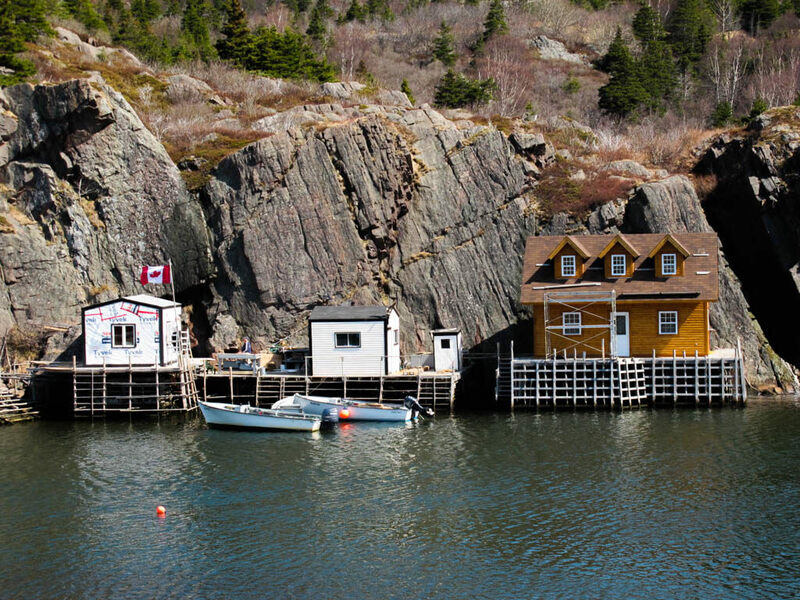 Quidi Vidi Village is a picturesque community with beautiful small houses set against the rocky cliffs. It is a must visit for any photographer! For those who are interested in beer tasting or a brewery tour, Quidi Vidi Brewery is the perfect place to visit. 8 different beers are brewed there, including the famous local Iceberg Beer. The Geo Centre is located at the base of Signal Hill and features exhibits related to geology, space exploration, oil and gas exploration, and the Titanic Disaster. Most of the centre is underground, where you can see the 550-million-year-old natural rock formations of Signal Hill. There are some nice views of the city from the nearby trails as well. A mural near the Geo Centre. The Basilica of St. John the Baptist is a National Historic Site and is known for its beautiful statues and ornate gold ceiling. -The best way to get around St. John’s is by renting a car. As Newfoundland is an island, there is a limited number of rental cars available, so reserve a car at least a few weeks before your trip. -Due to its proximity to the sea, St. John’s is often very windy. Be careful when hiking on trails near the ocean. -St. John’s is one of the rainiest cities in Canada, so it is a good idea to bring along a waterproof jacket. Locals don’t carry umbrellas as the wind renders them useless. Which attraction in St. John’s interests you the most? Have you ever visited St. John’s? TELL ME in the comments below. Your photos are so gorgeous! And I think I’d want to go whale watching most of all these things, how stunning would that be! I’m really hoping to get to Canada soon and can’t wait to explore all it has to offer. Those icebergs look incredible, I’ve never seen anything like them! Great post! I had no idea the Newfoundland area was so gorgeous! Fort Amherst in particular looks absolutely stunning… and that place with icebergs looks insane! This is so cool, I didn’t know that Newfoundland existed until this post! The hills up high look so beautiful, you’ve captured the place so well. Are those actual icebergs in your photo?! I would love to visit here once I go to Canada. I am glad that you now know about Newfoundland thanks to my post! 🙂 Unfortunately, a lot of people don’t know where it is haha. Yes, those are real icebergs. That spring they floated close to shore! Definitely visit Newfoundland when you go to Canada! There are many amazing hiking routes, 😉 I love the jellybean houses too! Wow, the buildings here are stunning! I love colourful wooden houses but that pink and white art deco one is my favourite! What a beautiful town! I miss Newfoundland so much can’t wait till next summer! Beautiful photos. I’ve been there many times but not recently, would love to go back someday. I’ve been to 9 of the 10 places on your list, missed St.Patrick’s church. I lived there when I was a young girl. It is a magical place for sure. The people there are so very freindly and would give you the shirt off their back if you needed it. I remember every Sunday we had lobsters for dinner fresh from the sea. The fishermen there are awesome! I plan on retiring there. Once that ocean air gets in your blood are hooked!